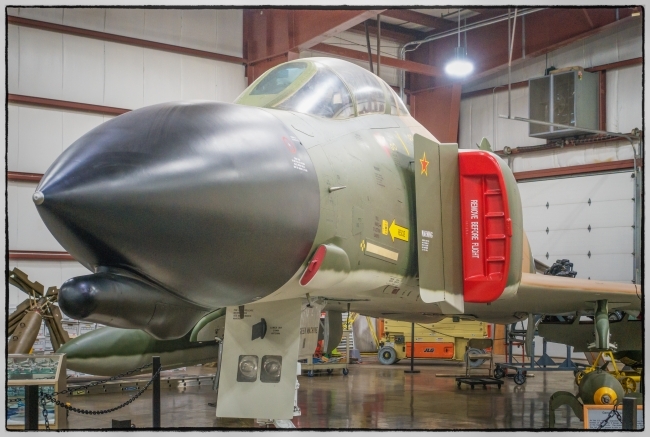 For over three decades, the long-range two-seat, twin-engine, all-weather “Phantom II” jet interceptor fighter/bomber proved its worth with the U.S. Air Force, Navy and Marines (and it was the first American aircraft to be used by these three branches concurrently). In addition to its use as a fighter/bomber, variants were used for photography, reconnaissance and as “Wild Weasels” for suppression of enemy air defenses. It served with many other nations as well and were manufactured under license in England, West Germany and Japan. The plane’s first flight was in May, 1958 with production reaching nearly 5,200 of all versions with the last delivered in 1981. After seeing combat in both the Vietnam War and the 1991 Gulf War, the plane was gradually replaced in the Navy with the Grumman F-14 “Tomcat” and McDonnell Douglas F/A-18 “Hornet,” in the Marines with the Hornet, and the Air Force with the McDonnell Douglas/Boeing F-15 “Eagle” and the General Dynamics F-16 “Fighting Falcon.” The last plane left U.S. military service in December 2016. While many thought its unorthodox design with its drooping tail surface and upswept wing tips ungainly when if first came out, it has become arguably one of the finest combat aircraft of the 20th Century. This entry was posted in Aircraft, Things. Bookmark the permalink.